The Philadelphia Phillies’ addition of Carlos Santana, who owns a career .365 on-base percentage, could move Rhys Hoskins to left field on a permanent basis. The Phillies agreed Friday to a three-year, $60 million contract with veteran first baseman Carlos Santana, the franchise's biggest free-agent signing in seven years, and a stunning transaction that signaled a sudden change in philosophy for a team that had pledged at-bats to a young player at every position in 2018. That slow rebuilding process now has a veteran face. The addition of Santana, who owns a career .365 on-base percentage, could move Rhys Hoskins to left field on a permanent basis. It could spur a trade for a young pitcher that involves one of the team's promising outfielders. It could serve as an indicator to other big-name free agents that, yes, the Phillies will handsomely pay for their services. More than anything, it was a $60-million message that the Phillies have emerged from the darkest times of their roster teardown. Santana turns 32 next April, and the Phillies were enticed by the chance to obtain him on a three-year commitment. The deal, according to a source, is pending a physical. It includes a club option for 2021, MLB.com reported. The term — shorter than what other sluggers J.D. Martinez and Eric Hosmer will receive — mitigated some of the risk in a $60 million deal. The Phillies, earlier in the day, traded their longest-tenured player to San Diego for a minor-league pitcher. With Freddy Galvis gone, J.P. Crawford is the shortstop. Crawford is unproven, but he was hailed as an on-base machine in the minors. The two transactions Friday added significant on-base percentage to the Phillies' everyday lineup. 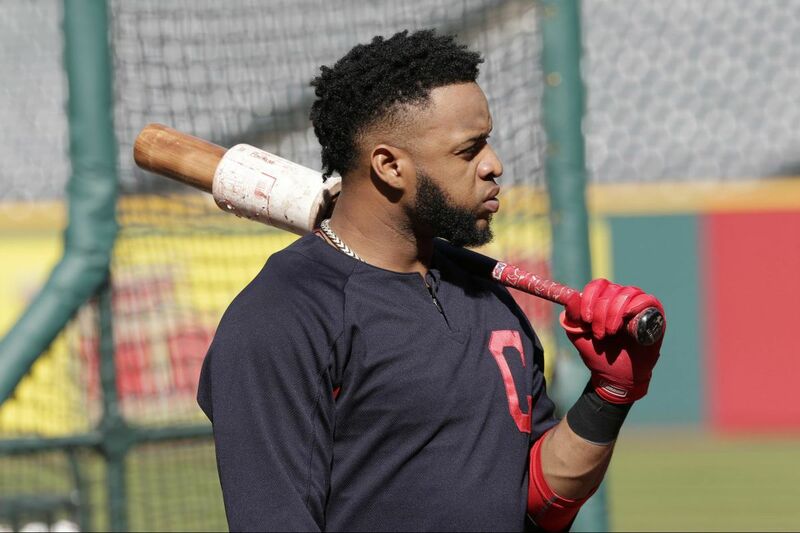 Santana, signed by the Los Angeles Dodgers out of the Dominican Republic, had spent the last decade with the Indians' organization. He began as a catcher, and in recent seasons had transitioned to first base with occasional time as a designated hitter. He has not caught since 2014. The Phillies do not plan to use him there. The Phillies moved Hoskins to left field last season before his major-league debut in order to play Tommy Joseph and him at the same time. Hoskins seemed comfortable in the outfield, albeit inexperienced. The Phillies had favorable internal assessments of Hoskins' defense in left field — enough to believe that, with more time training to be an outfielder and further instruction, he could improve. But someone's at-bats will be sacrificed in the outfield. The Phillies ended the 2017 season with three young, capable outfielders in Odubel Herrera, Aaron Altherr and Nick Williams. There is not room for all three, plus Hoskins, on an everyday basis. "The most important thing we can do is let these kids continue to play," Klentak said Monday before this sea change, "because they were pretty darn good when we gave them a chance to just play." The Phillies could rotate the players to keep them fresh and add flexibility to the roster. Those two things, both Klentak and manager Gabe Kapler have said, are priorities. But it could reduce the value or effectiveness of those players. All three of the starting outfielders from last season can play in all three spots, which would make the rotation somewhat easier. The other scenario is a trade that includes Herrera or Altherr or Williams — maybe along with second baseman Cesar Hernandez and a few prospects — for a young, controllable pitcher. Three major-league sources said the Phillies have inquired on just about every young starter that could be traded this winter. That includes Kansas City's Danny Duffy, Tampa Bay's Chris Archer and Toronto's Marcus Stroman. Santana has averaged 656 plate appearances per season in each of the last seven seasons. He started 139 games at first base in 2017 after spending most of 2016 as a designated hitter. He provides a credible middle-of-the-order bat the Phillies have not owned for years. He had an .818 OPS with 23 home runs last season. Santana has posted a .350 or better on-base percentage in seven straight seasons. The Phillies have had four such seasons from all of their players spanning 2011-17. Cleveland made a qualifying offer to Santana, which means the Phillies will lose their second-round pick in the 2018 draft and $500,000 from their international signing bonus pool for 2018-19. The Phillies, according to a Boston Globe report, outbid the Red Sox for Santana. It is a contract filled with risk — Santana's $20 million annual average value is the club's largest for a position player since Ryan Howard. But the Phillies have a blank payroll slate, and team officials are ready to spend.